PESHAWAR, 25 September 2014 (IRIN) - Humanitarian attention during the ongoing Pakistan army offensive against militants in North Waziristan Agency (NWA) has focused on the roughly one million internally displaced persons (IDPs) who have fled. But a less accessible group of people exist: those who stayed behind. "In each village where the conflict goes on, there are people who chose to stay - to look after homes or livestock," said Hassan Ahmad*, an NWA IDP in Peshawar. "My cousin is among them." Many of those who decided not to flee are now far from basic services and humanitarian support. "We have been trying to get food supplies through to them, but the trucks from Bannu are not being allowed in," said Safdar Dawar, president of the Tribal Union of Journalists. "The conditions are terrible." 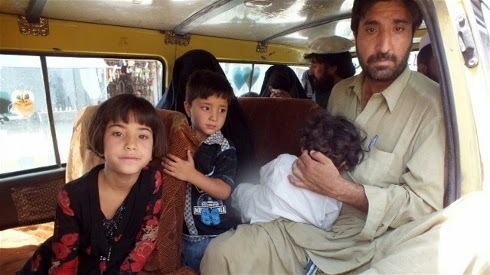 As a result of the military action, access to NWA is extremely limited, but Dawar estimates that close to 40 percent of the population has remained despite the army operation, a figure disputed by security officials. "Those who stayed behind are desperate to keep their homes and property safe," said Ahsan Wazir, based since late June in a camp in the Bannu District of Khyber Pakhtunkhwa Province. The 1998 census put the population at around 400,000 people, though that number recently has been estimated at around a million. Ahmad said village homes were being demolished by armed forces, leaving hundreds without shelter. "There is also no medical aid since hospitals in Waziristan are based only in the main towns, Miramshah and Mirali, and these are not functional right now," Ahmad said. Several tribes who refused to leave their homes have been forcibly shifted, say some of the IDPs, and have still not been allowed to return home. The FATA (the Federally Administered Tribal Agencies) Disaster Management Authority says more than 630,000 IDPs have been verified by the National Database Registration Authority (NADRA) as displaced from NWA since late May, according to the UN Refugee Agency head of its Peshawar sub-office, Jacques Franquin. Around 74 percent of the displaced are women and children, says the latest humanitarian bulletin from the UN Office for the Coordination of Humanitarian Affairs (OCHA). Very few humanitarian agencies currently work in NWA, according to OCHA. Instead, work has focused on IDPs in neighbouring areas. "The situation in North Waziristan is very grim, we understand," said Mingora-based human rights activist Shaukat Saleem. He said attempts had been made to send observers into NWA, but that this had not been possible so far because roads are blocked by the military. "No one has been left behind"
The situation of those still in NWA has not been commented upon by the government or by other agencies. State security officials deny anyone remains in NWA. "The population of North Waziristan is over one million, and no one has been left behind. There is no one guarding homes," a security official told IRIN, asking not to be named. He said it was uncertain how long the military operation would continue. People still based in North Waziristan, such as Ahmad, say the military is now in charge of all administrative affairs in the area. An administrative official who asked not to be named said the people who had chosen to stay behind had done so "of their own free will" and mostly consisted of young men, while women, children, and older people had been sent away. He said many felt it was necessary for them to remain - despite military warnings - to safeguard their belongings. Some say they are tired of repeated displacement. One NWA resident who stayed behind and prefers anonymity says he is now deeply concerned about the women and children in his family that he sent away. "I worry all the time about my wife, who is expecting our third child, and about my two young children who are with her at the camp in Kurram Agency," said the man from a village near Mirali, a major NWA town. He said it was difficult to communicate with his family as mobile phone connections were poor, and often suspended in the areas where fighting continues. He had heard conditions at camps were "very poor" but was unable to leave to try and join his family because his elderly mother was unable to travel and also because many routes were blocked. For now, the problems in NWA seem set to continue. Despite the gains that the Pakistan military says it has made, fierce fighting continues in many areas, according to media reports quoting the military, and it is unclear when people who have left will be able to return. Meanwhile, those who have stayed on must cope with bombed houses and destroyed land, adding to their difficulties in eking out any kind of livelihood.